Singapore Airlines confirmed on Tuesday that its second-quarter net profit had nearly tripled following stronger than expected operating results. The stylish and award winning airline earned $190 million (Singapore Dollars) which equates to approximately $139.26 million US, in the three months to 30th September. A massive jump fro last years total of $65 million. 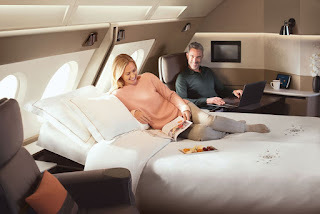 Singapore Airlines is currently undertaking a three plus year transformation plan which is designed to make the carrier more cost efficient and competitive as it goes forward to 2020. One of the big recent projects was unveiling its new Airbus A380 offering with a completely enhanced on-board cabins and services. Singapore Airlines has been finding trading difficult recently with increased competition from low-cost carriers in the region as well as those full service airlines from the middle east and the carrier posted a surprise fourth quarter loss in May.